These are foot inserts to help with pressure reduction and redistribution. Many foot conditions are treated with orthoses. Foot orthoses ae also used to help prevent injury, pain and discomfort. Heel pain is a common complaint that podiatrists treat. There are many different causes that range from an injury related to sport or trauma, to a sudden gain in weight during pregnancy. Foot types and shapes differ immensely from person to person and this alone can be a contributor to the problem. Common diagnoses include: plantar fasciitis, heel spur syndrome, Baxter’s nerve entrapment and Achilles tendonitis. Heel pain in not limited to these conditions and therefore it is advised if you are suffering from heel pain to make an appointment for a biomechanical assessment. During this consult your podiatrist will check your gait, assess your foot joints and test your flexibility. A diagnosis can then be made from the results and a treatment plan can follow. Treatment options often include: Heat therapy, massage, trigger point therapy, taping and strapping as well as orthotic management. In Australia, Diabetes has been on a steady rise, Diabetes is a systemic disease that affects several different parts of the body. The feet may also be affected and therefore a diabetic foot screen should be conducted annually by your podiatrist. At Auburn Podiatry, we use equipment to assess the integrity of the arteries that supply blood to your feet as well as tools to check how well the nerves conduct signals to the skin and muscles of your feet. All tests are non-invasive and painless. A detailed report is sent to your GP and diabetes specialist. During the consult, your podiatrist will discuss the results with you and advise you on diabetic foot health to minimise potential risks. Children can have varying foot troubles, from an in-toeing gait to growing pains, every child and their development is different. Common complaints include: fallen arches, tip toe walking, knock-knees and limping. Children are also susceptible to painful plantar warts and ingrown nails. If parents are concerned about any of the above issues, a thorough gait analysis will be incorporated into the assessment. Ingrown nails can affect anybody at any age and can be a debilitating injury if not treated promptly. There are many causes of ingrown nails, these include but are not limited to: poor nail cutting techniques, wearing tight shoes such as high heels, sports such as soccer, football and cricket, nail shape and trauma. Treatment options such as conservative care where a part of the offending nail is cut and cleared away as well as any debris that might have contributed to the problem. If the ingrown nail has been a long standing (chronic) issue, nail surgery may be suggested to remove the ingrown portion permanently. Hyperkeratosis also known as callus is a common ‘over growth’ of skin. This mainly affects the soles of the feet around the heels, the ball of the foot and under or on top of the toes. The causes of callus are commonly attributed to an uneven distribution of pressure, scar tissue or poor fitted footwear. Corns are very similar in formation to callus in that they present in areas of high pressure. They differ as they are conical in shape and have a core that is called a nucleus. Corns also differ slightly depending on where they present. Heloma durum is also known as a hard corn and these often present on the tops of the toes, at the ball of the foot or around the heel. Heloma molle is also known as a soft corn and commonly presents in between the toes. Heel fissures are cracks commonly found around the heel area. These cracks form for different reasons. Common causes include: dry skin, being bare foot, diabetes and standing for prolonged periods. The fissures can be so deep that they may bleed; they may cause discomfort and can be aesthetically displeasing. Heel fissures require the hard skin around them that has formed to be debrided. By doing this, the healthy borders can come together and heal. The use of a heel balm or an emollient will help reduce the incidence of the heel fissures returning. Tinea pedis is also known as athlete’s foot or trench foot and is one of the most common foot complaints podiatrists diagnose. Tinea is caused by a fungal infection that affects the skin and present in different forms, it may have small vesicles that a fluid, it may present in between the toes or may present as redness up and around the arch area. 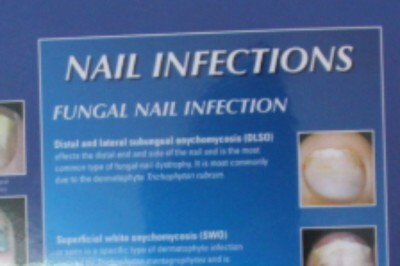 Onychomychosis is a fungal infection of the nail; it is a common problem that is caused by the same pathogens as tinea. There are many different presentations of onychomycosis. This can affect the nail or nails in different ways such a superficial infection, this is likely to sit on top of the nail rather than penetrate the nail to any deep structure. Other mycoses are deeper within the nail bed and can affect the growth of the nail causing thickening. It is important to get a positive diagnosis as thickened nails may mimic onychomycosis.